(AP) -- They are the ghastly images of a summer fouled before it started. Squawking seagulls and majestic brown pelicans coated in oil. Click. Gunk dripping from their beaks. Click. Big eyes wide open. Click. Even the professionals want to turn away. They can't. When environmental groups try to tug at the public's heart and wallet, they focus on what biologists call "charismatic megafauna." It's the feathered or furry helpless critter that you can relate to. It's not the oiled hermit crab - an image joked about as not very touching by Jon Stewart on "The Daily Show" Thursday night. 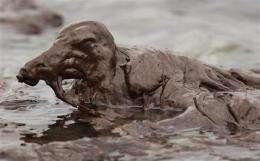 Up in Alaska, where it has been 21 years since the Exxon Valdez spill, residents watching the images of oiled birds are turning off their TV sets because it is just too hard to see, said Nancy Bird. She is director of the Prince William Sound Science Center, which still monitors the effects of the 1989 spill. The brown pelican, the state symbol of Louisiana, is now also the symbol of death - not just for the birds in the pictures, but for the likely thousands unseen. Some species of birds, especially those that lurk hidden in marshes - such as the clapper rail, seaside sparrow and mottled duck - will not be photographed coated with oil. They'll just disappear sight unseen, Driscoll said. Corexit was used so it would hide 95% of the spill beneath the surface. They are lying about spill size. It is much worse -and still going strong!!. Haliburton, Cheney, etc, are involved in this up to their eyeballs -the same A-holes ran the system when two towers were attacked, and the one plane went over 27 air bases. You know, the kind of bases where guys sit in fighters 24-7, waiting to be called into the sky. Yet nothing happened but a giant war -where following the money led to the usual suspects. So where does that place this oil spill in the grand scheme of things? Wait until hurricane season starts and the oil and contaminants start coming down in the form of rain, and takes out the entire soil system. This year's hurricane season is going to be stronger than normal. People need to settle down, think ahead - and find the hidden agenda. Things like this don't happen all on their own. Those who run the planet necessarily think further down the road. I have often found that whining, complaining, and finger pointing fixes problems real quick ... er, uh, wait, ...wait till the fog lifts and my head quits spinning. Well, 910k gallons of corexit, they say. Over 100 tankerloads. That has got to be a direct lie, in my direct knowledge and experience. We could not get a delivery of a tanker of a material that we had planned 3 months for..for 1.5 weeks past the delivery date. All available trucks, anywhere, were delivering corexit to the gulf. Now the shock point: WE ARE IN CANADA! This means that the entire eastern to midwest tanker truck supply is exhausted - bringing that brutal nerve toxin (corexit) to the gulf. Corexit involves Monsanto. Directly, BTW. It destroys nervous function. Like Aspartame. Aspartame, Monsanto. Haliburton-Cheney. Monsanto, Aspartame and Agent orange, and GM seeds (Brutally toxic corn filled with pesticides that is creating fungus in people's lungs/bodies -thus flu like symptoms, killing 1M in the US, is the suspicion, so far). Monsanto, that's Donald Rumsfeld's 'ex'. Well, carp, what a group to appear (again) out of the blue like that. What are the odds? hmmm?